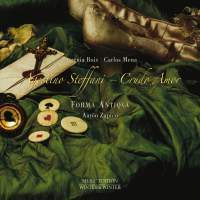 If the music of Agostino Steffani is no longer a complete unknown (thanks largely to the efforts of Cecilia Bartoli and recent productions of the opera Niobe), his music still isn’t exactly mainstream, even in the early music world. Normally this might betray some weakness, some fatal flaw in the music, but you can search all you like and you’ll find nothing but instinctive emotional expression and bold dramatic writing in Steffani’s output. Even Charles Burney was a fan. Some have speculated that the composer’s unusual life – spent largely in Germany, working not just as a musician but as a diplomat, bishop and probably spy – may account for it, preventing Italy from taking ownership of music that taught the young Handel a lot of what he knew. But whatever the truth, Steffani is long overdue a comeback and not just in the opera house. This new album by the Spanish soprano Eugenia Boix and countertenor Carlos Mena puts the composer’s chamber duets in the spotlight, with the help of Aarón Zapico and Baroque ensemble Forma Antiqua. Filling the gap between Monteverdi and Carissimi and the later works of Telemann and Handel, these miniatures are packed with musical drama, and make for a thrilling and varied recital. Sections of athletic counterpoint give way to languorous suspension-filled exchanges between the two voices, with accompagnato recitative leading into full da capo arias. These really are operas for the salon. ‘Begl’occhi, oh Dio’ and the title-work, ‘Crudo Amor’, are among the most attractive multi-movement works vividly championed here by Boix and Mena, balancing vocal beauty and drama with characterful support from Zapico and his musicians. The instruments are very present in the mix throughout, and it’s a balance that works well for chamber music where the voices offer only part of the interest. This album might not singlehandedly set that Steffani revolution in motion but it’s a big step in the right direction.